The algorithm detects the highest vibration (in scalar units) of all four sections of the engine during the whole flight and takes a snapshot of the remaining parameters. The vibration data are transfered to the next flight leg upon engine start. The AAVM broadcasts the vibration data together with the current and historic maintenance levels on ARINC 429 labels 302 and 303 to the ACMS system. 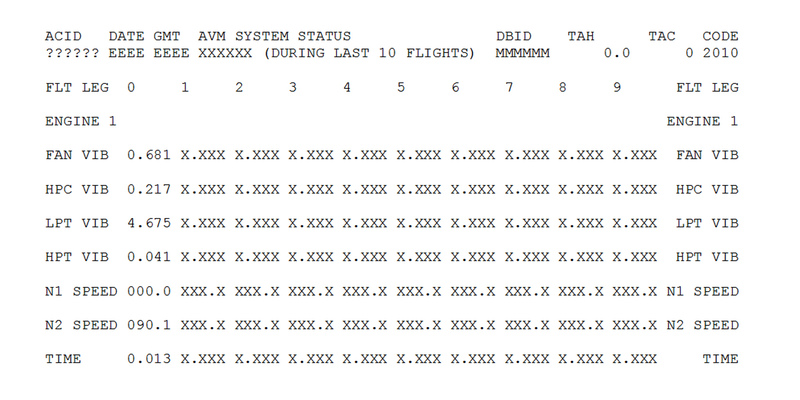 These data can be printed on an ACMS report or downlinked via ACARS to the airlines operational control center. Boeing Aircraft Maintenance Manual chapter 77-31-00 requires an inspection of the Magnetic Chip Detectors of the engine in case of an alert. The FADEC system broadcasts the DMS status via the Display Electronic Units to the ACMS system through ARINC 429 label 271. The monitoring of the status of the magnetic chip detectors can be done from cockpit or remote from the home base using an ACMS report, which is downlinked automatically via ACARS.